I was thinking that photos of large rooms could be done with 2 people and one strobe. One person to run the camera---one to walk around firing the flash. Take a large number of photos, then layer them in photoshop and do some creating erasing/layer merging. Anyone tried this? Any success? I was wondering because I have one high-powered flash (Sunpak 622) and not much else as far as battery powered lighting. Benjy von Cramon has done that. He wrote an article in the NSS News a few months ago. I just finished a few using this technique. Planning is everything if you plan on using layering. Most of what I have seen involving layering looked a little rough. the use of the eraser tool is NOT recommended as I have seen some doing it and it is easy to see where one layer is and where another starts (even if you use a soft brush). Use a gradient mask if you are using Photoshop. If you are doing big room photography, try to have the heading on your flashes pretty much heading the same general direction otherwise you will end up with fake lighting conditions. Feel free to email me on this topic and I will offer what advice I can. In the old days, we used to put the tripod-mounted camera on Bulb and use one flash many times, covering the lens inbetween moves. You'd get a composite-flash picture in about half an hour without any fancy work required, as long as your flashes didn't overlap too much. I have used Photoshop to merge photos together, it can work alright but needs alot of fine work to be convincing - zoom in on the stitched area and hand-doctor the seams with the various tools. I find sometimes if you set your monitor to super-bright the errors show up better; then when you return it to normal it looks pretty good. ian, that technique is still widely used with film to this day. Technically its not a composite as all the elements of the image are being exposed to a single frame of film. You can do the same with digital set to the bulb setting but the longer you leave the shutter open the more "digital noise" you get. This is the main reason several digital photographers have turned to multi-image composites. If i'm not mistaken the Robert Coomer image is a single frame film that was capped between model poses. Very awesome and creative shot. Seems like that how I read the writeup on it in the NSS news. Could be mistaken though. Point is, your options are growing. Digital options follow some of the same rules as film. Be creative and have fun. When someone tells you thats a crazy idea just remember that some of the best things came from crazy ideas ;-) Keep the descussion alive. Thanks for the comments. I forgot about the article in the NSS News. I have a very low end version of Phototshop (5.0 LE). I don't think that I even have the gradient tool. Any experience with Elements? I took some classes on Photoshop 7 a few years ago, and was wondering if Elements do enough. Caves are rare and precious things. Cavers...even more so. Treat each accordingly. I did a lot of multi-flash work years ago. This one taken in the Swiss cave Holloch won an Honorable Mention in an All Army photo contest around 1983 or so. There are 4 flashes in it. The camera was mounted on a tripod as I walked down the passage with the flash. This is also an excellent example of the large phreatic passages typical in Holloch. That passage has a really cool shape to it. Looks almost like a diamond shape. Back to the layering thing, Paintshop Pro might be able to pull off what you want to do at a fraction of the cost of Photoshop. I used PSP about 6 or 7 years ago but not for very long as I got into Photoshop pretty quick. Most common programs like that have very similar tools (maybe listed under different names) I remember ow I hated working in flash because they referred to keyframes as "tweening". Man that ate me up. But great results need not come at great costs. Below are a couple links to some software that I have used and currently still use that may help you. I think both have free demos that run for 30 days or so. The dogwaffle program is very cool. Photoshop Elements is not very expensive. I got it on eBay for about $20. We use it at work and I liked it so much I wanted a copy for home. I do a lot of multiple shot images, though you have to weigh the photoshop work and skills vs the work to get it all in one shot. Sometimes one outweighs the other. The above mentioned self portrait is about 9 images put together. The background is a stitch of 2 or 3 images. It was shot as 2 "sets" where I moved the camera and my spotlights. This image that won in the B+W salon several years ago is about 9 images stitched together. I have also used this technique in Camps Gulf and other areas when my lens wasn't big enough, or I didn't have enough light sources. Though in Camps Gulf my problem was bulb misfires that didn't give me one consistently lit shot, so I combined them all to build one. very cool Robert. Thanks for the insite. I love that pic "good help is hard to find" very creative. You do great work. 1. If you're combining layers to build up a "big room" shot of separate flashes, you don't necessarily need to do any erasing of the dark areas. Just use "lighten" as the blending mode and the lit up area will show through an unlit black area in the layer above it. Some complications may arise if flashes overlap and then you will need to probably do some graduated erasing. But use a layer mask whenever erasing to make your efforts easily reversible. 2. Another area this blending technique really excels for is increasing your dynamic range, i.e, your bright to dark capture ability such as in looking out an entrance. You want the outside exposed properly (a short exposure) but you want the nice shadow detail the light shows on the cave walls as well (much longer exposure). So you take two, on a tripod, and sandwich them together. Done right, it can be hard to tell it wasn't done in one photo. I have Paint Shop Pro. What would be the procedure for using a gradient layer for this effect? Thanks for any help. Barbara refers to the June '04 NSS News article in which I wrote about rethinking lighting and camera techniques by limiting each exposure from a tripod to one light source, leaving the decision of how best to combine multiple lighting sources for later in the 'puter for greatest flexibility and control. Here's an image taken with Willie Hunt and friends in Lost Creek Cave in which one person (me) set strobes for over 70 exposures. The layered photoshop file, each exposure comprising one 11 mp image, was about 1.5 gigs, needed all of my 4 gigs of RAM to efficiently work through â€” ouch! I'm confused by what is meant by "fake lighting directions". Fake=artificial, ie. by man not nature. 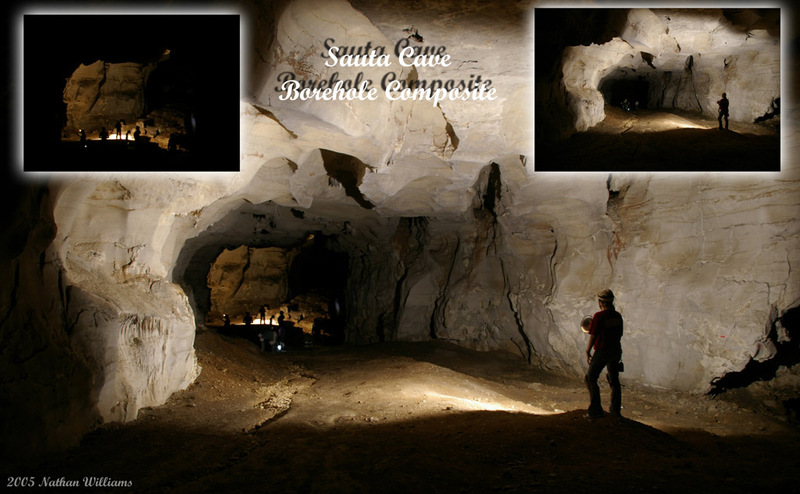 Multi-strobe lighting inherently breaks all the rules of natural lighting, which in a cave spells b-l-a-c-k. It's common convention to create key lighting, fill lighting, and rim lighting, so pushing these concepts is simply breaking convention in the name of experimentation. Fair?